Noel Hanna who with his wife Lynne is attempting to he the first married couple in Northern Ireland to reach the summit in May 2008. The couple launched the Ulster Cancer Foundation's 'Personal Everest Project' with cancer survivor Peter McAlindon (pictured left) who will join Noel and Lynne on the first leg of their expedition. DROMARA couple Noel and Lynne Hanna are preparing for the adventure of a lifetime, as they aim to become the first married couple from Northern Ireland to stand on top of Mount Everest, all in aid of the Ulster Cancer Foundation. Noel and Lynne have attempted to reach the mighty summit before but after Noel suffered severe problems with his eyes caused by the altitude, they were forced to abandon their attempt. However Noel returned to Nepal and was on top of the world in May 2006 when he reached the summit of Mount Everest on his second attempt. While Lynne was delighted that Noel had attained his goal, she was disappointed that she was unable to join him on the expedition and the couple always intended to return to Nepal to conquer the mountain together. "It has always been at the front of our minds to go back," said Noel. "Lynne is really looking forward to it. Hopefully we will make it but you never know what will happen. I went in 2005 and I was feeling confident. You just don't know how the altitude will effect you." Noel and Lynne are starting their long journey at the end of March and if everything goes to plan they should reach the summit in the middle of May. As well as climbing Everest Noel is also hoping to complete his '7 Summits 2 Sea Level' challenge, which will see him climb the highest peaks in each of the seven continents of the world and return to sea level under his own steam. With just two summits left to do, he is hoping to attain his goal by the end of the year. "I have completed five out of the seven," explained Noel. "I still have one to do in Papua New Guinea in August/September and I am hoping to end the year with an expedition to Antarctica. Hopefully it will be a big year for me," he added. NOT only is climbing Mount Everest a great personal and physical challenge, but Lynne and Noel want to use their expedition to raise £150,000 for the Ulster Cancer Foundation to fund a major new support programme for cancer patients and their families in Northern Ireland. Lynne, who is also General Manager for Clarins in Northern Ireland, explained: "This is an ambitious fundraising target so we want to encourage as many people as possible to get involved and help us achieve our £150,000 target. We know not everyone has the opportunity or inclination to go to Everest so we're asking people to think about a challenge in their own lives that is their 'Personal Everest' and which they can use to raise funds for this worthwhile cause." Noel and Lynne will also be joined on the first part of the expedition by Peter McAlindon, who was diagnosed with lymphoma five years ago at the age of 36. "He will be climbing to 7,000 feet proving that, even if you have been ill, you can still achieve your goals," added Noel. Joyce Savage, Head of Appeals & Marketing at UCF added: "We are thrilled that Lynne, Noel and Peter are using this once-in-a-lifetime experience to benefit cancer patients in Northern Ireland. Their dedication, commitment and loyalty are a great inspiration and we wish them every success as they prepare for their expedition." 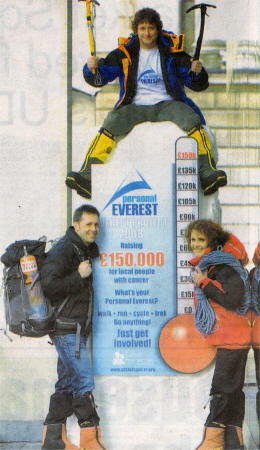 For further information on the Personal Everest Project please click on www.ulstercancer.org; email personaleverest@ulstercancer.org or contact Sarah/Leonne at UCF on 9066 3281.